Twenty Ten has support for the “gallery” and “aside” post formats (it retains its backwards compat support of the special “Asides” and “Gallery” categories). That was done very quickly, and I’m soliciting feedback for how that should be conveyed. Head over to the ticket. This is great. I’ll give it a spin in the next says. Kudos on this feature. That is great – I’m so exited to make use of them. There is a great deal of potential with this concept. Great job! Is there a method for adding new post formats? It seems the supported post formats are hardcoded into get_post_format_strings(). There’s a filter on the output of that function. Called, oddly enough, “post_format_strings”. As of r16205 there isn’t. Something gone missing? Remove post format strings filter. If this is going to be standard, it should be standard. There was, but I yanked it. The idea here is to standardize. Post Formats are, to start, not much more than a taxonomy convention with a UI wrapper. So if you have “Asides” on one theme, you can transport them to another theme. If people create their own formats, their portability will be zero, or close to zero. While this feature is getting started, at least, I think it makes sense to have requests for new formats go through core. That way we can announce new ones with fanfare, put them on the Codex page, and themers can update their themes to support them. Maybe once we’ve iterated a few times and have covered all the common use cases, we can make it easier to deviate. But to start, a managed economy will result in better standardization. It’s an unusual way to do things for WordPress — the difference here is that the main sell we’re offering is portability, and flexibility would hamper that goal. Well, if we’re going to standardize to a set, then might I suggest adding “audio” for podcast usage? Possibly also “media” or something else for generic multimedia usage. Say for including Flash content that doesn’t fit into Video? Since it requires the theme to add support, why not just add a bunch? Video, audio, a generic media, image (for a photoblog style), etc. @Mark – That is beyond awesome. Just wow! As many on wp-hackers know I’ve pushed many times for additions to the core to enable standardization on various fronts and every time I’ve gotten push-back and told that I could write the feature myself. Clearly the idea of creating a standard to promote interoperability among themes and plugins wasn’t a concept that was being appreciated, at least not related to my suggestions. So I’m just REALLY glad to see a feature added to core not because core needs it per se but because it enables themers to add layers of functionality that can be ported between themes. This has the potential to be hugely beneficial to the WordPress ecosystem. Double kudos to you and the team for this one. @otto and @alex – i agree. besides multimedia (image/ videos/audios), i’d like to add one for events. and maybe in future releases, we could link event format to calendar and create a unique archive page for event format, which displays event posts within a calendar like layout. Don’t the post formats get their own template in the template hierarchy? Like single-postformat.php, although that could conflict with custom post types. How does it feel with “Format: Post” as “Default” conveys little information? I think the issue with that is that they’re all Posts. Blog post, maybe. Great point. 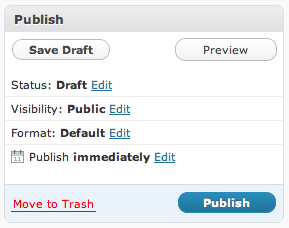 “Blog post” sounds good to me, or pretty much anything other than “default”. I remember a theme named default. She was a good theme. I’d use “Regular post” to be clearer. Another option is “Normal post” but i think that might convey other posts formats are not “normal”, that’s why Regular post sounds best to me. I would rather most themes do not use this default UI, even if it’s improved as I suggest above, because ideally we want them to go a lot further. For example: If something is an Aside, why show the title box? Formats have the opportunity to simplify people’s posting experience, as-is this is just another option. Maybe we need to auto-hide even more of the metaboxes when they don’t apply to the format as well? To me that suggests more of a tab UI above the whole post area, rather than something inside the publish box. (Things may jump around.) That might be a lot for 3.1, or maybe not. If you don’t show a title box you’ll have to re-do the whole posts overview as well. Or your asides will all show up as Auto-Draft (or what it was). Not very user-friendly. It would be awesome to be able to select/switch post formats with 1-click (as opposed to 3 right now). So where do we draw the line between post formats and custom post types? The main difference seems to be that you have a lot more control and power with cpts (including over the ui), and formats are supposed to be theme-agnostic? It’s just a way to flag the post as a certain style/type so that the theme can style it differently — they’re still normal posts and therefore don’t deserve a CPT. Asides are posts for example, but they’re short and so are often styled differently. I did a couple of mockups of what i think would be a nice way to show them. It would be two-click, easy to spot but not distracting (at least to me), and since it’s something i’d probably edit before writing the post, i think the position is not bad at all. In any case i think a little mockup can help others get more ideas too. I did put some quick and dirty icons copy pasting from the admin panel. The position in the title box may not be the best one for lower resolutions but somewhere near the area would feel right to me. Probably not the best position for it given that some formats don’t even have titles, but this is really cool. Also a fan of the icon attempts. This is too late for 3.1 though, we won’t be thinking about this until 3.2 at the earliest and we’re happy with the UI we have now. But we’ll revisit this at some point and I’ll keep this mockup in mind for sure. Also, if you’re a designer, you might be interested in participating in our UI group: https://make.wordpress.org/ui/. See the sidebar on that blog for their meeting times. I really like this idea, but think that it should extend to all taxonomies which the users could define via screen options. While you’re looking for post types / formats – please add “events” to the list. Events have their own format which could be supported by custom fields, taxonomies etc – e.g. when where what who and so on. In many ways, this is no different to media and video/audio needing their own format. Events have (at least) two dates associated – date of posting, and date of event – these are rarely the same. I brought up events too, but then they pointed out that Events are really better handled by Custom Post Types which you can already do in v3.0. Post Formats are really for different use-cases. FWIW. I really like the idea giving post a certain format. That may save some time for those who insert lots of pictures from time to time. Can’t wait to see the results. Happy coding! I have wanted this for so long. Are there eventual plans to expose fields specific to certain types? For example, a quote should probably have an “Author” and “Source” fields. Or is this better left to plugins? If the plan is to define specific post formats, Tumblr-style, then that would be logical. A question to ponder; given that Post Formats are “intra-loop styling”, it would seem that some of them could be Post Type-specific? For example, I could see an Event as having different formats such as “Single Presentation”, Single Day”, “Multi-Day”, and probably more. Thoughts? It’s a way to describe their functionality, but that’s not the reasoning behind them, which is standardization and portability between themes. Good point. I applaud the effort to enable a standard for portability; that’s probably more important that too-much flexibility in this case. People can always come up with a custom field value as a switch for their own custom themes. Love the feature already. It always annoyed me to format posts by selecting a category. Can’t wait to select , or formats in the WordPress for iOS app.